For the final mystery box challenge of the season, the contestants were asked to demonstrate how far they had come. 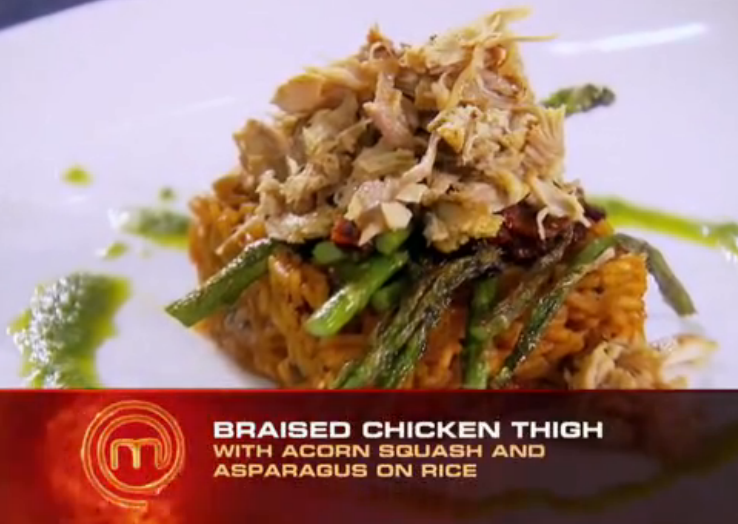 They had to create a dish featuring chicken with an open pantry, just like one of the first challenges of the season. Jennifer struggled, turning in a dish with overcooked and undercooked components (Bacon Wrapped Chicken with Apples and Jalapeño). Christian (Bacon Wrapped Chicken with French Onion Sauce) and Adrien (Braised Chicken Thigh with Acorn Squash, Asparagus and Rice) created better dishes, but the judges only offered high praise for Adrien, who won the challenge. For this challenge, I decided to do an “empty the fridge” type of dish. 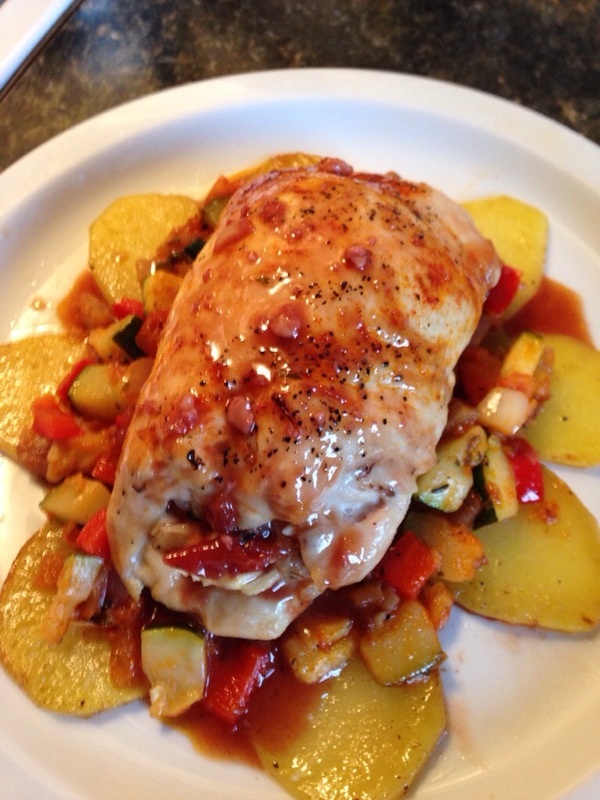 While that’s not really what I usually do on this blog, I thought that I had ingredients on hand to do a great stuffed chicken breast with ratatouille and truffle-butter potatoes. For the chicken breast, I made the stuffing out of feta, chopped bacon, minced garlic, chopped yellow onions, thyme, oregano, and crushed red pepper. After mixing all of this together, I pounded out the chicken breast, spread the stuffing evenly over the top of the chicken and then rolled it all up so that the chicken totally enveloped the stuffing. I seasoned the chicken with salt, pepper and paprika, and poured in enough chicken stock to cover the bottom of the baking dish. I baked this in a 375 degree oven for 45 minutes, spooning the broth over the top of the chicken every 15 minutes. While the chicken was cooking, I started making the sides. While I did not have the ingredients to make a traditional ratatouille, I certainly had enough to create my own version. I simply sautéed some chopped zucchini, chopped red onion, diced tomatoes, minced garlic, and chopped red bell pepper in some olive oil and butter. I let the vegetables cook together for a little bit. Then, I added a couple tablespoons of arrabiata sauce and seasoned the whole mixture with salt, pepper, oregano, basil, cumin, and cayenne pepper. I let this all cook together on low until the vegetables were tender and ready to serve. For the potatoes, I simply fried the slices in some butter for a couple minutes per side, sprinkled them with truffle salt and then popped them in the oven on a baking sheet until they were fork tender. The final component of the dish was the red wine reduction. 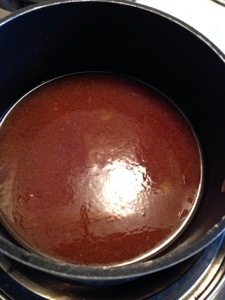 When the chicken was finished, I took the broth from the bottom of the baking dish and poured it into a sauce pan. To this, I added an equal amount of red wine (in this case, a pinot noir that I had on hand), a tablespoon of honey, and the juice of 1/2 a lime. I let this simmer until it was reduced by half. I plated the chicken breast on a bed of the truffle potatoes and ratatouille with the red wine reduction spooned over top. Overall, the dish came together pretty well. The ratatouille and potatoes were delicious. I easily could have eaten just those and been perfectly content. The chicken, on the other hand, was just ok. The feta did not keep the chicken moist like other cheeses I have used in the past to make this dish. And the crushed red pepper was too strong, giving the stuffing, as a whole, a bit of an odd flavor. The red wine sauce was very strong. I let it reduce too far and I used a fairly cheap wine, so the overall flavor was much too sharp. 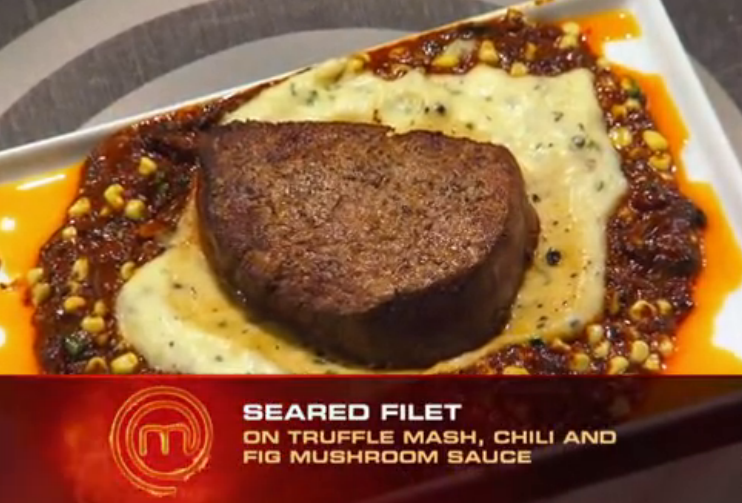 While there are definitely some tweaks that need to be made to improve this dish, I do think that it could be refined into quite a delicious meal. Employment Update: So sorry it has been so long since my last post but I have been traveling a lot and have been quite productive: 2 Weekend Trips, 6 Interviews, 6 Job Applications, and 25+ E-mails. Having won the last challenge, Jennifer was able to pick the main ingredient to be featured in this week’s aphrodisiac-themed elimination challenge. 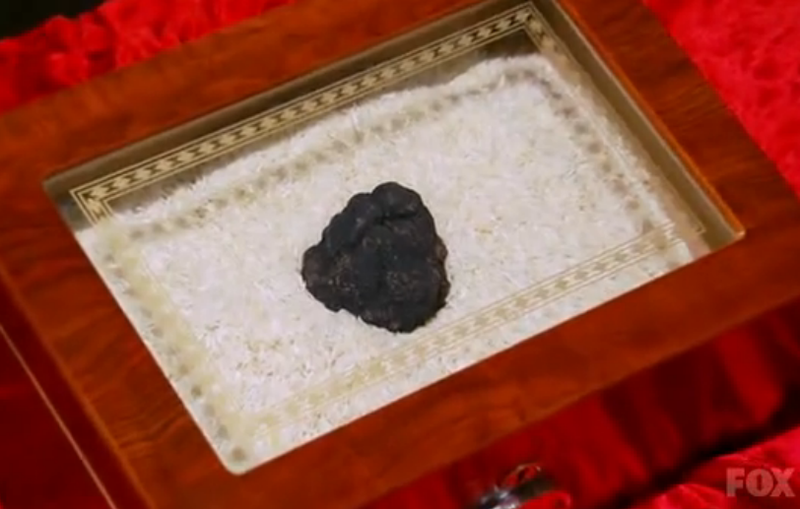 Jennifer decided to skip the oysters and artichokes and picked the black truffle for the chefs to cook with. She was then given the option of cooking or drinking champagne while watching the others cook. She foolishly decided to cook, and then paid for that decision later. 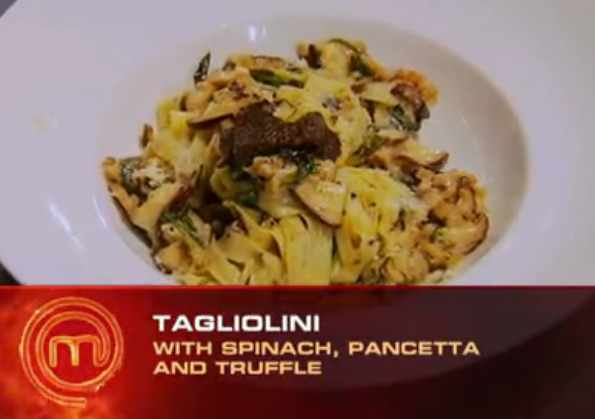 Tracy (Truffle and Corn Soup) and Giuseppe (Tagliolini) were the top two and named captains for the next team challenge. 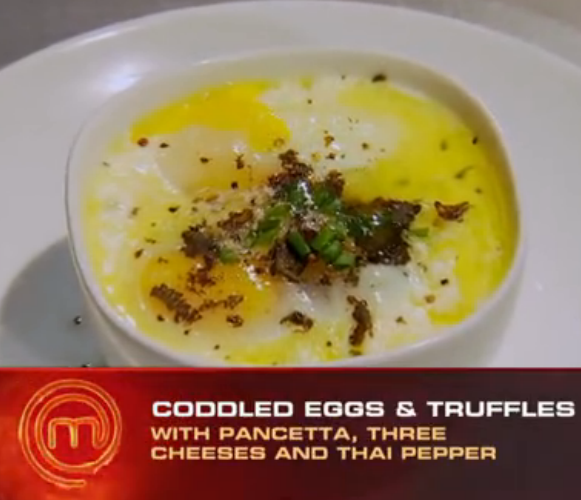 Erryn (Truffle Steak), Adrien (Seared Filet) and Jennifer (Coddled Eggs and Truffle) landed in the bottom 3. Luckily, Jennifer’s hubris did not cause her to be sent home with Erryn’s dish being declared the worst. 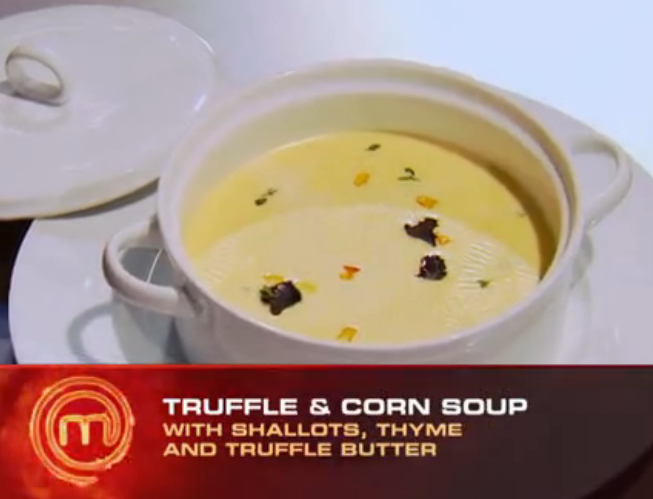 I immediately decided that I wanted to attempt a truffle risotto for this challenge. In thinking about a protein to serve with it, I knew that I wanted to try something a little different. 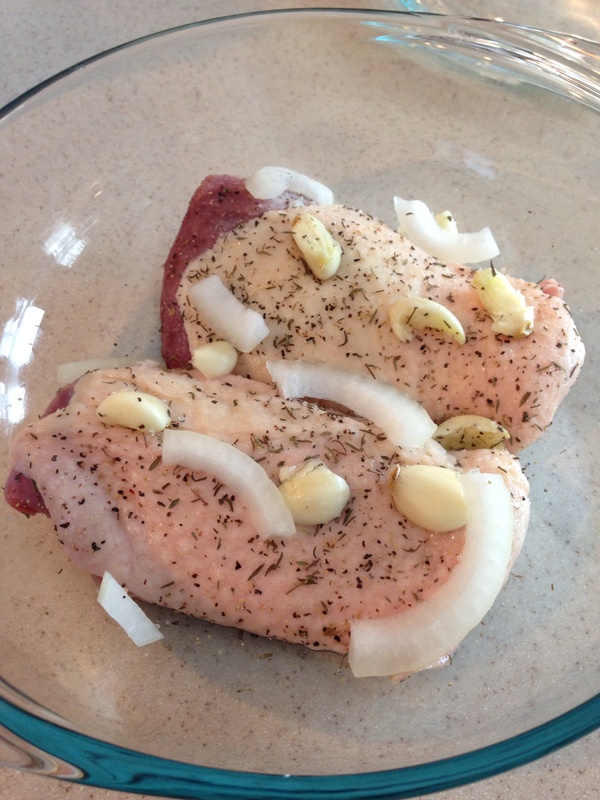 One of my favorite things to order in restaurants is duck confit so I decided to make an attempt at my own version. While it is typically done with duck legs, I was only able to find duck breasts (even after a couple trips to different stores). 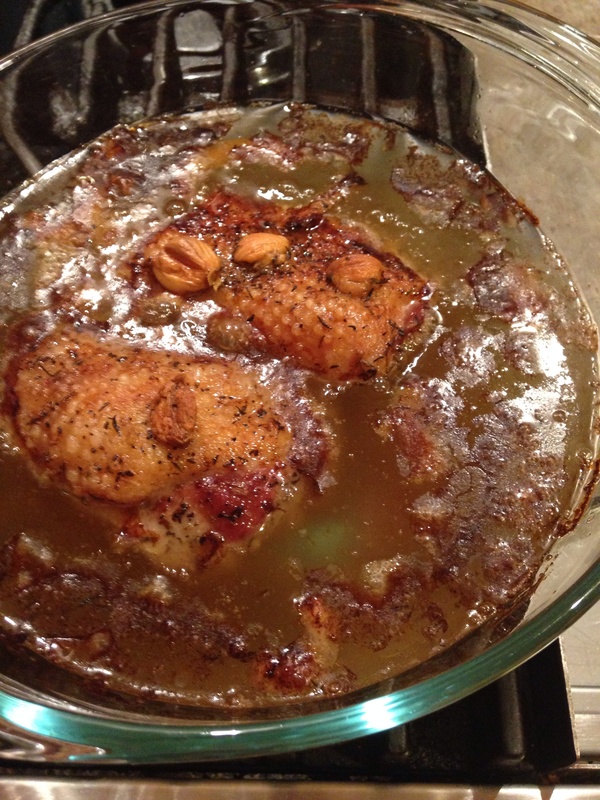 I followed this recipe: Duck Confit, with the only difference coming at the end. 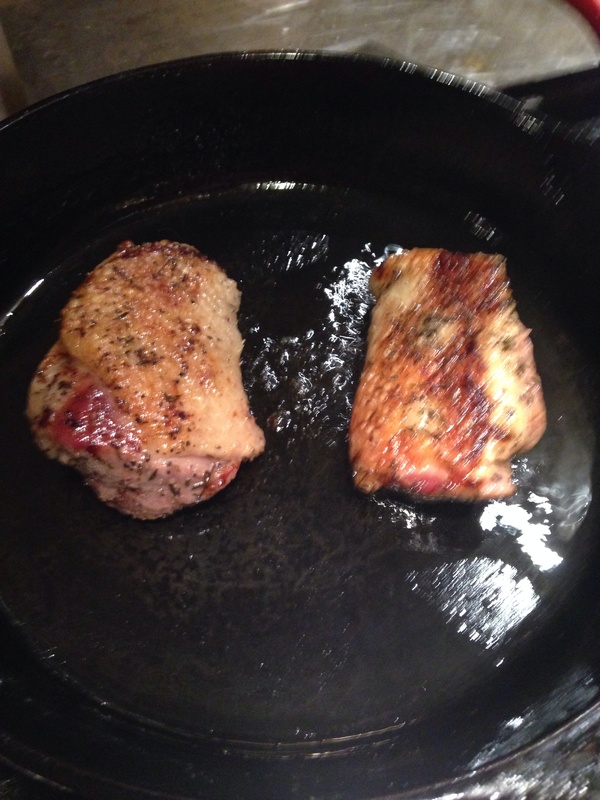 I quickly pan seared the breasts on both sides before serving instead of cooling and storing the duck. The pictures below show how the duck was seasoned and stored the night before, the duck in the melted duck fat before and after cooking, and the duck breasts being pan seared after cooking. 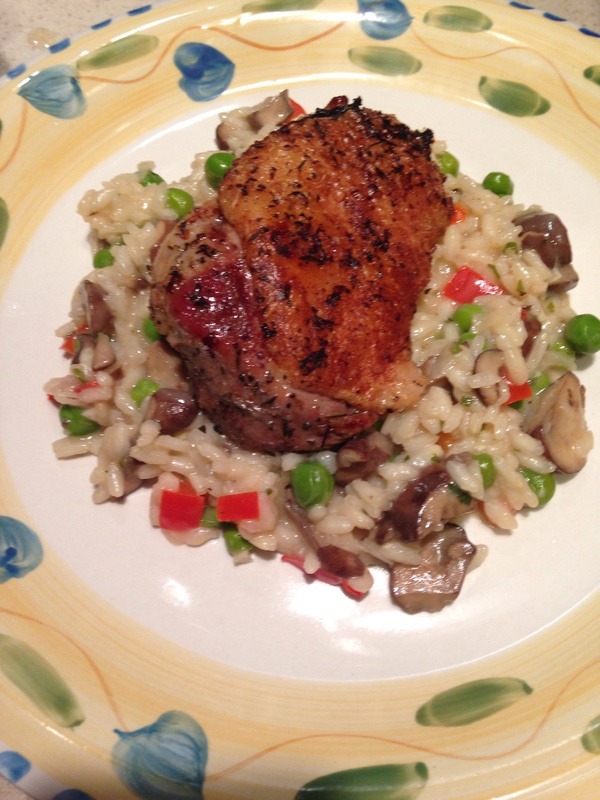 While the duck was cooking in the oven, I worked on the risotto. 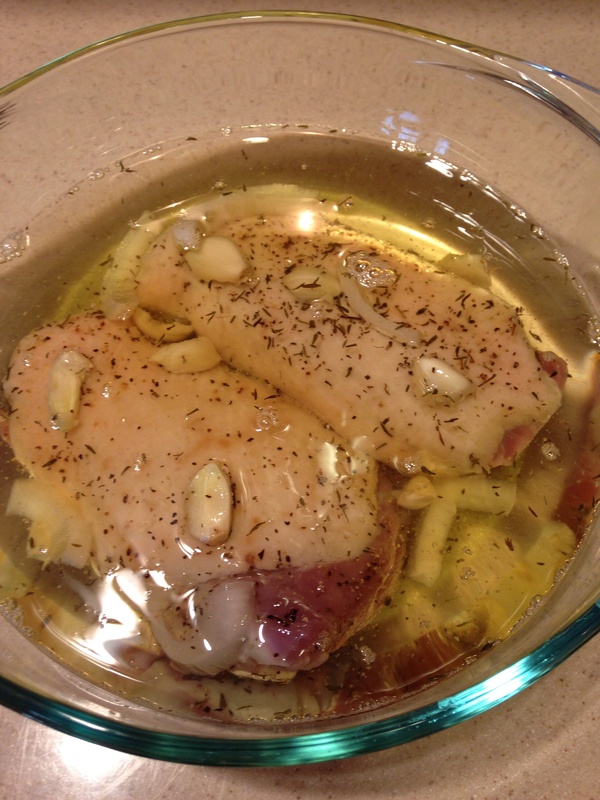 The first thing I did was heat 5 cups of chicken broth in a pot on the stove. 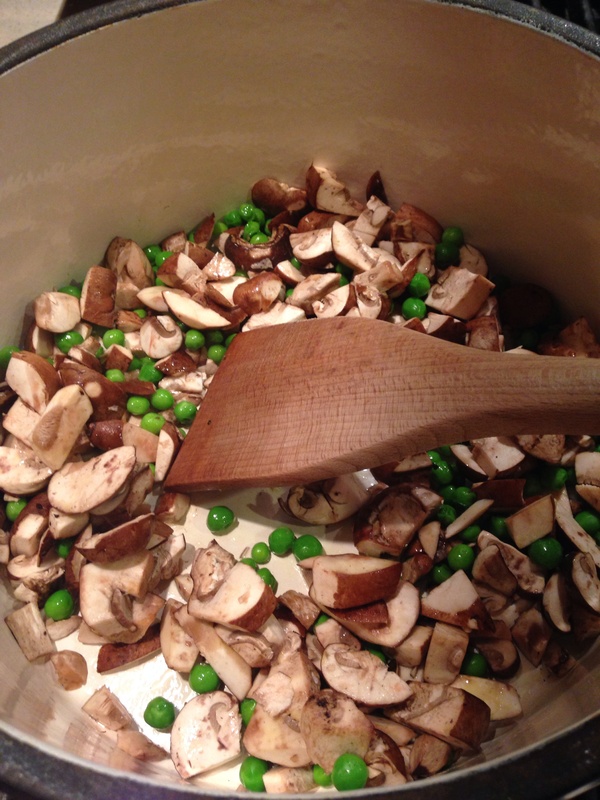 Then, I sautéed 8 ounces of baby bella mushrooms and 1 cup of english peas (which I had previously shelled and blanched in salted boiling water for 2 minutes) in 2 tablespoons of black truffle oil until tender. When these were done, I removed them (and the juices) from the pan and set aside for later. Next, I put 2 more tablespoons of black truffle oil in the pan with 4 cloves of garlic (minced), 1/4 of a small yellow onion (finely chopped), and 1/2 of a medium red bell pepper (diced). 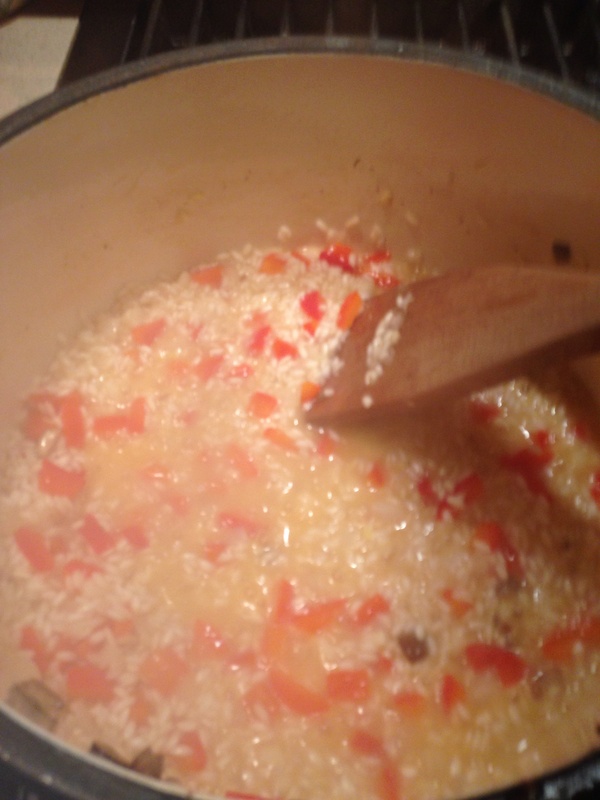 I cooked this until the onions were translucent, and then, added 1 and a 1/2 cups of arborio rice. I let this cook until the rice became golden, and then added 1/2 of a cup of white wine. Once the rice absorbed this, I added the chicken broth to the risotto 1/2 of a cup at a time (stirring constantly) until the rice had absorbed all the liquid. Then, I mixed in 1 tablespoon each of fresh finely chopped parsley and chives, 1/3 of a cup of parmesan cheese, 4 tablespoons of butter, a pinch of black truffle salt, the cooked peas and mushrooms with their liquid, and salt and pepper to taste. I plated the duck breast on top of the risotto and served. This was a great dish. The duck was tender and juicy. 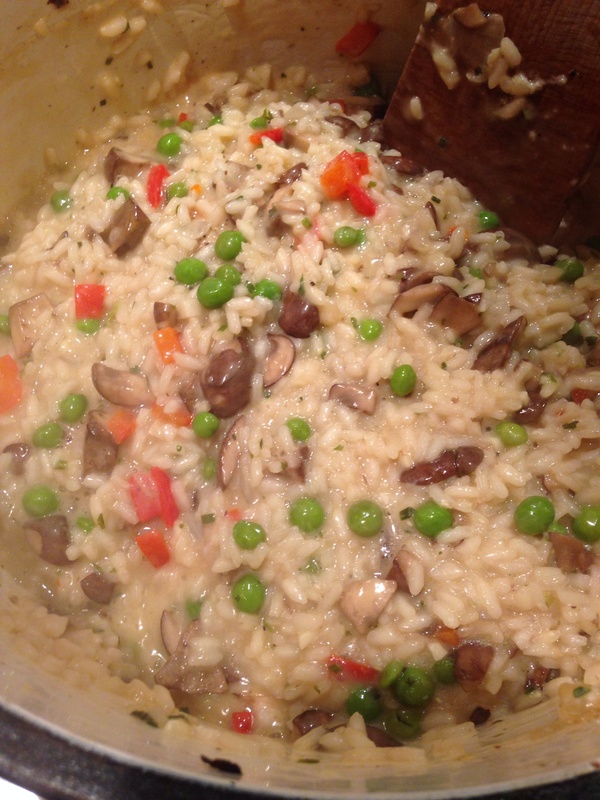 The risotto was cooked perfectly and had excellent flavor. The only issue was that the truffle flavor was very subtle. For a challenge that needed to showcase truffle, that was definitely an issue. Although, had I been able to work with real truffle instead of simply truffle oil and truffle salt, I think that I could have gotten a richer truffle flavor throughout the risotto. 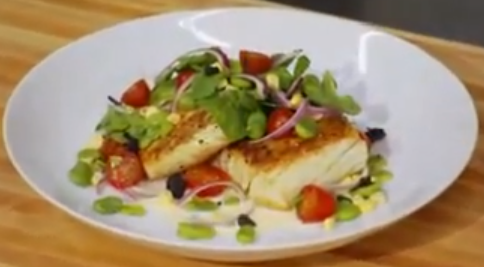 For this week’s elimination challenge, the chef’s were asked to recreate Cat Cora’s Truffled Halibut with Sweet Corn Zabaglione and Fava Bean Salad. 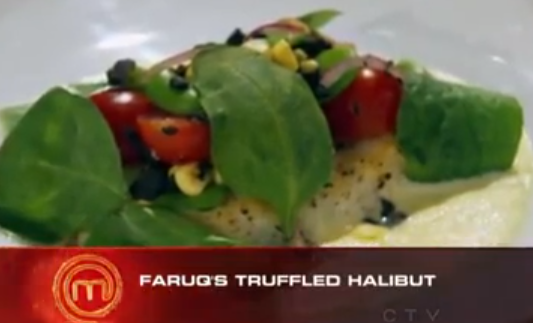 Sharone (last challenge’s winner) selected this dish and competed against Cat Cora for a chance to go straight to the top four. While he did not put out a better dish than Cat, he made a valiant effort and received praise from the judges for his attempt. 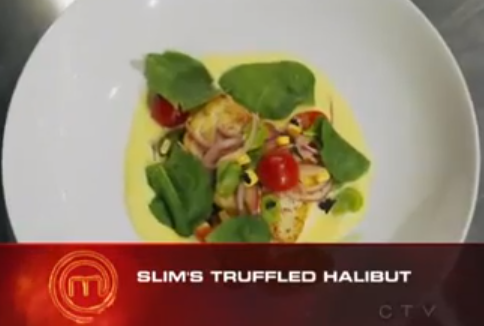 The rest of the chefs competed against each other to recreate the best version of Cat Cora’s original Halibut dish. 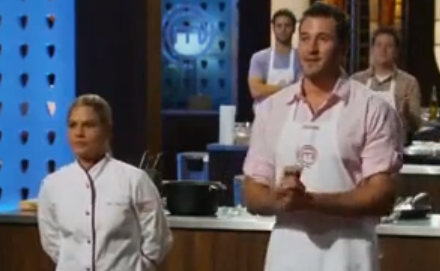 Jake turned out the judges’ favorite. But Slim, Mike and Faruq completed the worst recreations of the dish and Faruq was sent home after two straight elimination challenges in the bottom three. 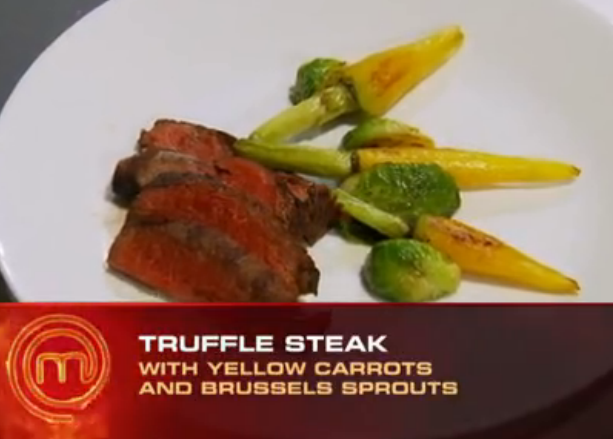 In order to recreate this dish, I used this recipe that I was able to find online. I followed the recipe exactly in order to get the most accurate recreation of Cat Cora’s original dish. While I was able to put out something quite tasty, getting this dish on the plate was a clusterf*ck. First off, my grocery store didn’t have fava beans so I had to sub them out and use dried lima beans instead. They basically turned to mush when I cooked them. I literally had to dig through the finished beans to find the ones that held their shape just a little. Then, the Zabaglione did not thicken up the way it should so my Dad (who, after several beers, said he wanted to help) decided to add some flour to it and turn up the heat. This worked for a while but then the sauce broke. It still tasted delicious but it looked a mess. Everything else worked out fine though and I was somehow able to turn out a mildly respectable dish (see below). Overall, the dish tasted great. 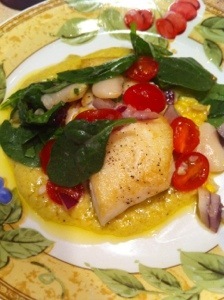 Presentation was sloppy but the flavors were right on and I cooked the Halibut perfectly. 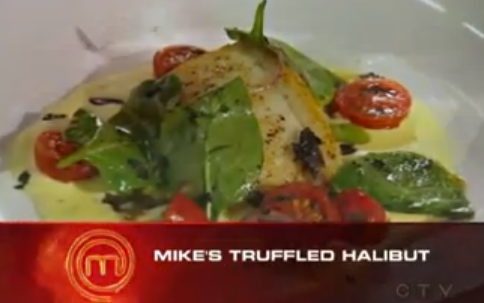 I don’t think I would have gone home on this dish but I certainly would not have had the best either.